In one bowl add ¼ cup Yogurt and pink pitaya powder. Then add the blackberries after they’ve been blended. In the forth bowl add matcha, yogurt and mint extract. Blend the kiwi and add to mixture. In the fifth bowl add pineapple, turmeric and yogurt after blending. In the sixth bowl after blending add yogurt strawberries, beet and pomegranate powder. In the seventh bowl add the plain yogurt. 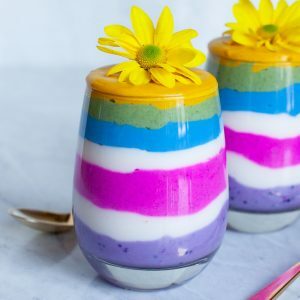 Grab a parfait glass or jar and add a layer of blackberry purple, then blue lemon, then green matcha, then yellow turmeric pineapple, then red strawberry pomegranate then pink pitaya, then white. Add a second layer and top with your favorite fruit and enjoy! Moments Marketing provides photography for social media, websites and corporate events as well as offers marketing consulting services. It's also a sister company to Moments Photography, a portrait photography company. Lisa is the owner, creative visionary and chief photographer of Moments Marketing and owner and photographer of Moments Photography.